The foundation stone for the Charles Bridge was laid in 1357, at 5.31am on 9 July. The medieval bridge over the Vltava river has survived many a disaster, war and floods, and ever-increasing numbers of tourists. The credit for this goes to a delightful legend: Numerology-loving King Charles thought that perfecting the timing of laying the foundation—it formed a palindrome (1357-97-531)—would give the bridge strength and protection. It doesn’t matter if you believe the story or not, Charles Bridge is still a thing of beauty. The legend just adds to its charm. 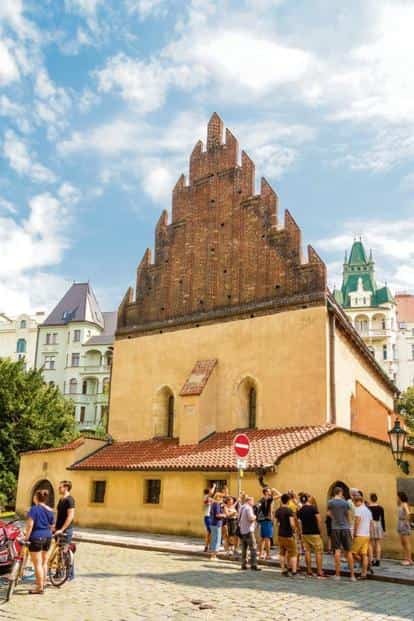 It’s something typical of the Czech Republic’s capital city, whose rich history has spawned many an interesting, and sometimes unbelievable, story. Charles Bridge is known as much for the musicians who perform along its length as for the 30 statues of saints that line its route. Though they are all replicas of the originals, their legends stand strong. The most popular being the story of St John of Nepomuk. The saint was allegedly thrown off the bridge by King Wenceslas IV for refusing to reveal the queen’s confessional secrets. It is believed that touching the plaque below the statue brings good luck. A nearby plaque with a dog and a knight also gets its fair share of attention, but that’s because most people just love petting dogs. A few metres away, a small cross (and a plaque), which marks the spot where the saint was thrown into the river, is believed to grant wishes. As statues go, there’s an impressive sandstone one of the mythical knight Bruncvik on one of the bridge’s pillars. He stands tall, armed with a golden sword, his faithful lion by his feet and the coat of arms of old Prague by his side. The knight’s magic sword, which chopped off people’s heads with just a command, is believed to be buried inside the bridge. 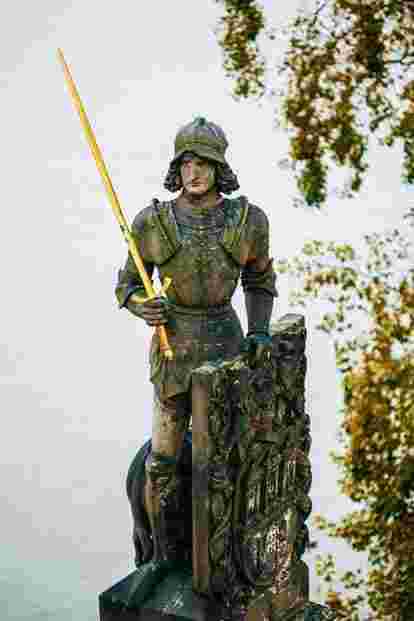 It is said that when the Czech Republic is on the brink of ruin, St Wenceslas will rise from the dead, or from the ashes of his statue at Wenceslas Square, and use Bruncvik’s sword to save his people. Till then, Prague’s fate lies in the mythical clay hands of the golem Joseph. One of the city’s most famous personalities, his fame is about the only thing known about him. He was the creation of the rabbi Judah Loew, who lived in Prague in the 16th century, at a time when Jews lived in fear of their lives. Rabbi Loew created a giant using the clay from the banks of the Vltava and breathed life into him. As he grew, the golem, who was supposed to obey the rabbi, started getting violent and killing people. The rabbi was promised the attacks on Jews would stop if he finished off the golem. One day, when Joseph was asleep, the rabbi performed the rituals required and removed life from it. The lifeless body was hidden in the rabbi’s synagogue, now the Old New Synagogue in the Jewish Quarter, ready to be brought back to life if needed. Another legend has it that the golem was brought back to life by the rabbi’s son and protects the city even today. If the golem’s fate is an indication of what happens when power goes to your head, the punishment for stealing can be found at the Basilica of St James. There lie the withered remains of the arm of the “One-Armed Thief". He was a man who attempted to steal precious items in the church. When he reached the statue of the Virgin Mary, it grasped his hand. In the morning, the man was found with his hand cut off. His arm now bears witness to what happens to those who disobey the commandments. An equally tragic tale is that of the Iron Man, one of the few statues in the world dedicated to a ghost. The ghost is Jáchym Berka, a man who was turned to stone as punishment for killing his lover in a fit of rage. It is said that he can be released from his ghostly prison by—here’s the fun part—a pure-hearted virgin girl. It’s a chance he gets only once, for an hour, every 100 years, on the anniversary of the murder. Another ghostly figure can be found outside the Estates Theatre. The shrouded faceless statue is supposed to be Il Commendatore, the character who appears as a ghost in Mozart’s opera, Don Giovanni. Guides will tell you that clicking a photo of the shrouded figure reveals a face hidden in the darkness. But the legend belongs to a time before phones and digital cameras—ghostly presences do tend to shy away from technology. The city also has its own version of Casper, that friendly ghost, who lives in Čertovka (devil’s stream). Karbourek, the pipe-smoking water sprite, is a friendly fella who surfaces when thirsty, in search of beer. Quench his thirst and he will reward you with some fish; ignore him and he may try to drown you. The stream, which is often called Prague’s Little Venice, gets its name from an ill-tempered woman who used to live there. She was called the devil by villagers, who painted the devil’s sign on her house to warn passers-by. She can still be found washing her clothes in the waters. Be warned, if she catches you looking, it is said you will die within the week. The beauty of these legends is that they all have some basis in history. These stories have drama, violence and just the right bit of magic to make explorations of the city memorable. In Prague, every corner has a story to tell. The tour seeks out buildings and haunted churches that feature in ghost stories and legends. Visit www.pragueexperience.com.